New Perspectives in Community Living is a publication of Southern Tier Environments for Living, Inc. and is published three times per year. 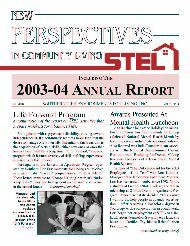 Our publication includes articles regarding STEL's services, program development, and organization news. To view our newsletter online you will need a pdf format reader. You can get your free reader here.